Inconcessus Lux Lucis are a UK based band who play a style of music that they call Saturnian Black Magick. Their music is firmly rooted in black metal, executed with a rock and roll attitude and with clear influences from classic heavy metal acts such as Iron Maiden, and Motorhead. After starting to perform live in 2015 the band have played a string of successful shows including two special guest performances on Mayhem’s recent De Mysteriis Dom Sathanas Tour. Their live shows are incense filled, blood-drenched musical assaults that evoke an otherworldly, dark and mysterious atmosphere, an atmosphere which is in keeping with the overtly adversarial intent of Inconcessus Lux Lucis and their mysticism laced, death venerating song lyrics. In 2016 the band travelled to Stockholm, Sweden to record their second full-length album with Tore Stjerna at Necromorbus Studio, known for producing classic recordings with bands such as Ofermod and Watain. 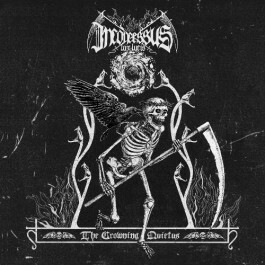 The result was a resounding success, Inconcessus Lux Lucis produced a record of arguably their most refined and potent music to date, and with the assistance and expertise of Tore Stjerna they managed to capture the necrotic and violent atmosphere the band create when performing in a live setting. The album is entitled The Crowning Quietus, and it is due to be released on October 31st 2017 on vinyl and CD via Invictus Productions and I, Voidhanger Records respectively. In late 2017 and 2018 Inconcessus Lux Lucis will be touring to support the release of the new album.